Priyanka Chopra Jonas knows how to strut in style. Her latest outing at Soho house in Mumbai. On the occasion of International Women's Day, Juhu's newest hotspot for celebs, organised a special dinner for the B-town celebrities and a lot of them made it a point to mark their presence. From Karan Johar to Arjun Kapoor, everyone arrived at the restaurant in style. But it was Priyanka who stole the limelight, completely. The lady walked in looking stunning in a short halter dress with fringes all over. It was teamed with knee-high boots in oxblood and a bag in the matching colour. 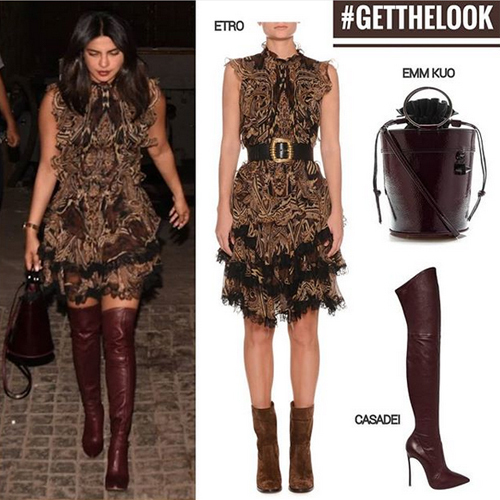 And well, it was the cost of Priyanka Chopra's halter dress, which left our head spinning. The amount that the global icon spent on a dress for a single outing is equivalent to the cost of a person's trip to Europe or can even buy you two iPhone XS mobiles! her dress is worth $2,750, which is approximately Rs 1, 90,155. PeeCee is stunning and she knows it! And you guys better get ready to see her slay in her Bollywood comeback film, The Sky Is Pink, directed by Shonali Bose. For those unversed, PeeCee is reuniting with her Dil Dhadakne Do co-star, Farhan Akhtar for the film. Farhan and Priyanka will be seen playing parents to Zaira Wasim in the film, which is based on the life of Aisha Choudhary.